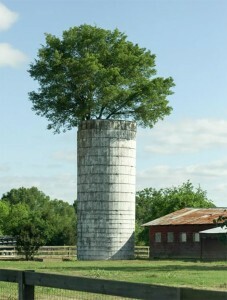 My sister sent me a picture of a silo tree one day. She came across it last year on the side of a road, and neither of us had ever seen one, but apparently with smaller farms dying out there are many of these trees in abandoned silos around the midwest. 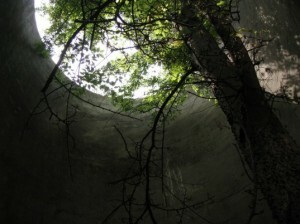 The roof collapses, a seed gets inside, and the silo becomes a secret nursery that protects a baby tree from the winds. But the little tree has limited time in the sun and works extra hard to find its way to the top, forgoing a lot of the bottom branches and growing extra tall, finally exploding into a giant canopy at the opening. The silo finds new purpose as a fortress, and a sapling that had slim chances in the harsh Great Plains winds ultimately grows tall and strong. Together they are a work of art. Everything about the tree reminds me of my sister's tenacity through life, especially this last turbulent year -- one where no matter how tired, sad or hopeless she was some days, she pulled herself up, took care of other people and animals and flowers, and she found reasons to smile.